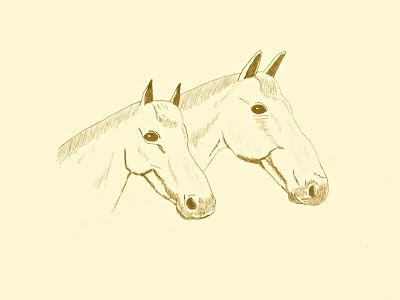 Horses are somewhat of a challenge to draw. Heads are difficult enough, but to draw the whole body is going to be more of a challenge. I'll get it one day. I agree, horses are so difficult. The joint of the neck to the head, the ear positions and the jaws are good: did they really have Roman noses?! ...these are nice, Roy! I hope to get out to visit with some horses over the next month or so. I need to be around them and photograph them for a while before I can even attempt to draw them. Before I broke my foot in 1985 I rode all the time...it's been a long time since I've been riding! !